What is a Seeded Tournament? 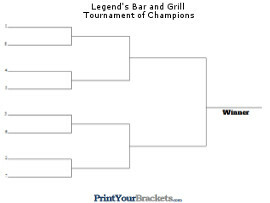 At the bottom of this page you will find all of the free printable Seeded Tournament Brackets that we have available. There are basically two ways to run single and double elimination tournaments, one is "Seeded" the other is "Blind Draw". A Seeded Tournament is usually ran during events such as Baseball, Football, and Wrestling. A Seeded tournament is organized in a way that the players are ranked based on previous results or experience. The match-ups are based on how well a team did during the season or league, and sometimes based on skill level or experience. The end of season playoffs in all pro sports use the seeded format. These tournaments can be either single elimination or double elimination. 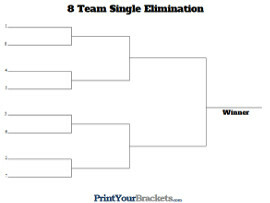 For more details check out How To Run a Single Elimination Tournament or How To Run a Double Elimination Tournament. How do I run a Seeded Tournament? The tournament begins by determining the number of players or teams that will be participating in the tournament. Once the number of players or teams has been decided you will need to print the corresponding tournament bracket from below. If you use the brackets below the seeding's are very simple and are always done the same way. The brackets are marked with numbers along the left hand side. The numbers run from 1 to the number of teams participating in the tournament. The number 1 ranked team goes on the blank line marked "1", the number 2 ranked team goes on the blank line marked "2" and so on. A seeded tournament is set up so that the highest ranked team plays the worst team, the second highest ranked team players the second lowest ranked team and so on. When the number of teams in the bracket is not a "Power of 2" the highest seeds receive "byes". We have devoted an article to explain How Byes Work in a Tournament. This can get confusing if you are designing your own brackets, that's we we have saved you the trouble and created them for you. Those are the basics for starting a Seeded tournament, visit the "How To Run A Tournament" links above for complete details on running an entire tournament. What is the difference between "Blind Draw" and "Seeded"? Unlike Seeded Tournaments, Blind Draw Tournaments are organized in a way the players are not ranked based on previous results or experience. The match ups are based solely on the luck of the draw. All of our brackets are available to print for free, most of our brackets now have the capabilities of being customized. When you find and click on the bracket you need, you will be directed to a sample view page. There you will have two options. If you click "Customize this Bracket" the printable bracket will load with the option to edit the title and print. If you click the "print" button just the printable version will load. Below are two sample images, the one on the left has the generic title, the one on the right has been customized.